Diversity. Art. Recreation. Technology. Green. These were some of the words that local college students claimed as their favorite attributes of Dayton—or areas they would like to see emphasized and enhanced in the region. Dayton Campus Connect kicked-off the school year – and their Web site – with a “Welcome to Dayton” party at Courthouse Square on Saturday. The event was open to all area college students and offered music, activities, and lots of prizes and giveaways. Updayton was there to listen to the concerns of the students. 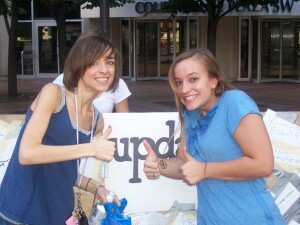 Updayton participated in the kick-off with an interactive art project. Each student stopping by the table was challenged to claim Dayton as their own city by writing down what they like best about their community, their ideas for change, and, if not from the area, the reasons that they chose Dayton as their adoptive hometown. Throughout the event, what was a blank slate was filled with both attributes of the area as well as aspects of Dayton that may need to be enhanced. Together the students created a mural by overlapping their perspectives of what the city can become. Team members Megan Cooper, Drew Fuller, Jennifer Fuller, Scott Murphy, and Hillary Steberl were thrilled to be part of the event. Updayton will continue to engage college students and young professionals in preparation for their first Young Creatives Summit planned for April 2009. Updayton members will be present at various local festivals and on college campuses as well as active in the community through services projects, recreational opportunities and sports leagues. Anyone who is interested in participating in summit planning or community engagement should contact updayton through getinvolved@updayton.com or attend the next meeting on Wednesday, October 8 at 6PM at 20 N. Jefferson Street. The Dayton Campus Connect kick-off gave updayton the chance to meet a lot of excited students ready to get involved in Dayton. The centerpiece of the Dayton Campus Connect initiative is a new Web site, www.daytoncampusconnect.com, which offers numerous student discounts at area merchants as well as guides to local activities and an event calendar. It is offered as a “one-stop reference for things to do in Dayton.” For more information on Dayton Campus Connect, visit their website. This entry was posted on Sunday, September 21st, 2008 at 10:14 pm	and is filed under updayton. You can follow any responses to this entry through the RSS 2.0 feed.